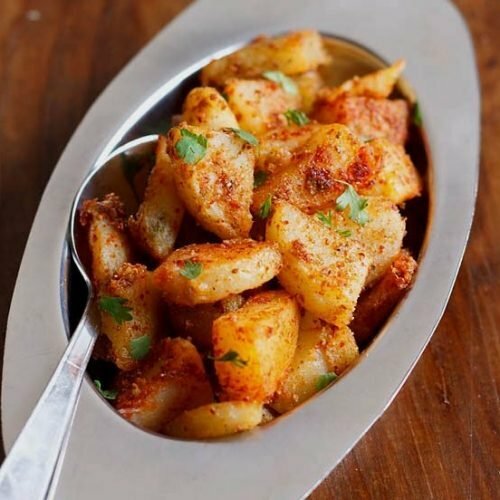 aloo chaat recipe - little spicy, tangy and crispy potato chaat. oil for shallow frying or deep frying. parboil the potatoes in a pressure cooker or pan in water to which some rock salt has been added. once the potatoes become warm or cool, then peel the skin and dice them. shallow or deep fry or pan fry the diced potatoes. drain on kitchen paper napkins. take the fried potatoes in a bowl. add all the spice powders and salt to the potatoes. toss the potatoes in these well. sprinkle some lemon juice on the potatoes. garnish aloo chaat with coriander leaves or mint leaves or both and serve vrat ki aloo chaat hot or warm. the spice powders can be adjusted to suit your taste buds.